Sergei Kiriyenko said an agreement on the new nuclear reactors was signed between Russia and India in April. Rosatom’s director-general on Thursday confirmed Indian media reports that a general framework agreement to build the third and fourth units of the Kudankulam Nuclear Power Plant (KNPP)was signed. “We’ll be able to settle all disagreements. On April 19 the agreement was signed,” Sergei Kiriyenko said on Thursday. He added that the commercial terms of building the third and fourth units were finalised. “The technical parameters have also been approved,” Kiriyenko said. Last month PTI news reported that the cost of the project works out to Rs 33,000 crores or $5.5 billion. India and Russia had planned on signing an agreement for the units as far back as December 2012 when Vladimir Putin visited India for the annual summit, but the countries could not find common ground on the law and the costs until last month. India has approved a large-scale programme for developing nuclear power engineering. Till 2017 nineteen nuclear power plants’ units with the capacity of 17,400 MW are planned to be built. Eight units will be constructed with the participation of other countries. In early May, KNPP’s first unit reached 90 percent of its operating capacity. After necessary permissions, the unit will reach full capacity (1,000 MW). The KNPP can withstand a strong earthquake or tsunami, members of the government committee for the evaluation of the nuclear power plant's safety said. 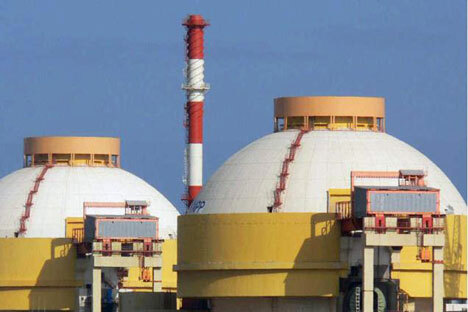 India is planning to build 19 nuclear power units with a combined capacity of 17,400 MW by 2017. Eight of them will be built in cooperation with other countries. In 2010, Russia and India signed a roadmap for building up to 14-16 Russian-design power units in India.